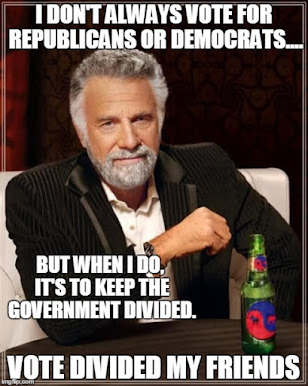 The Dividist Papers: There is work to do. 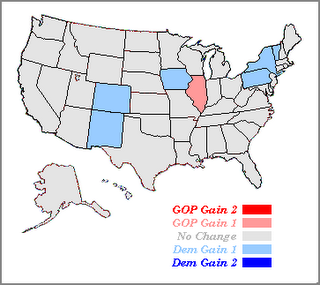 Scott Elliott, the "Blogging Caesar" at Election Projection is predicting that the Republicans will retain control of the Senate and the House in his 2006 Edicts #1 and #2 (linked and excerpted blow) . Now Scott and I both lay claim to the word "conservative", but we clearly mean different things. In his bio, Scott is a self-described "conservative, especially socially". While he limply expresses a flaccid preference that he "would like President Bush to be more fiscally conservative", he nevertheless asserts "I believe he is as good as it gets for America's top job". By this I can only assume that Scott means he does not really care all that much about how single party control under the leadership of this administration has dramatically increased the size and spend of the federal government, has expanded the breadth and depth of the bureaucracy, and has massively increased the debt load being piled on the backs of his children. 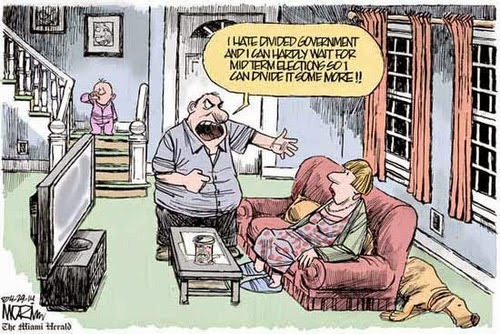 Nor does it bother him too much how the government has assumed extraordinary new control and power over our lives. Being a social conservative, I guess Scott feels that as long as the administration effectively stops the threat posed by two fifty year old lesbians getting married in San Francisco, they've got his vote. So this puts Scott Elliott (the Voter), is in the category of PDW (Partisan Dead Weight - as defined in my previous post). That said, Scott Elliott (the Election Analyst) is very good at what he does at Election Projection. I followed his site during the 2004 Presidential election and found it to be a great resource and remarkably accurate. For the most part, he is able to divorce his personal politics from his analysis. This year he is tracking the 2006 Senate and House races at an impressive level of detail and granularity. I expect to be using Election Projection as a resource throughout this election season. Since I do respect his work and analysis, I am troubled by his early prediction, but not too troubled. We really only have the one data point of his 2004 election prognostication to attest to his skills as a prophet, his early predictions from the spring of 2004 were not all that accurate, and (as far I know) he is untested in a mid-term election cycle, which is a completely different animal than a presidential election. But for anyone who longs for the relative fiscal responsibility and limits on government growth that can only come with divided government, his prediction reinforces that we should not be lulled into complacency by the president's low approval ratings, and recognize that there is work to do. Edict #2: "The GOP will maintain a majority in the U.S. Senate" "By edict of The Blogging Caesar, it is hereby decreed that the GOP majority in the United States Senate will remain for the next legislative session beginning in 2007. Moreover, the majority will be at least 51 seats, avoiding the need for vice-presidential intervention on straight party-line votes. I do hereby seal and deliver this edict this Friday, the 28th of April, in the year of our Lord, 2006." - Scott Elliott at 10:55am 04/28/06.